Each facility manager is responsible for planning his or her own revenues, assets and expenses directly related to a facility. 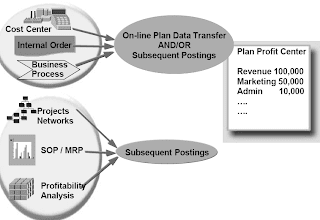 In addition, planned corporate overhead is allocated.Overhead costs for each facility are planned in the facility cost center and you decide to utilize the R/3 plan integration feature to automatically post these costs to the appropriate profit center.Corporate overhead is planned in a corporate cost center and simultaneously posted to an allocation profit center. For planning purposes these expenses are allocated to each facility based on square footage.Revenues for each of the locations is expected to increase by 5% and the revenue figures are copied from last year. n Some key assets are to be planned manually by each facility manager. To make it possible to control and evaluate internal areas of responsibility effectively, you should limit profit center planning to those values are measurable and can be influenced directly. Since the concrete organizational structure and scope of your company's responsibility areas depends largely on individual factors, it is necessary to create as flexible and mulch-dimensional plan as possible. Profit centers make the integrative character of company planning especially evident, since the plan data here is created in other applications, and can be supplemented or changed here. Profit center planning is a part of short-term corporate planning and thus encompasses a span of one fiscal year. The planning process combines individual planning areas into an integrated planning network. You can use different Plan Versions to reflect changes during the planning process or different planning scenarios at the same time. The integration of content and time-frames in planning is generally influenced by the following considerations.Objective of profit center planning is to summarize all the data from original account assignment objects which is relevant for planned profits for profit centers. In addition, you can plan any information missing from the source data directly in Profit Center Accounting.Long term planning is done on Profit Center Accounting, based on the manual planning functions. 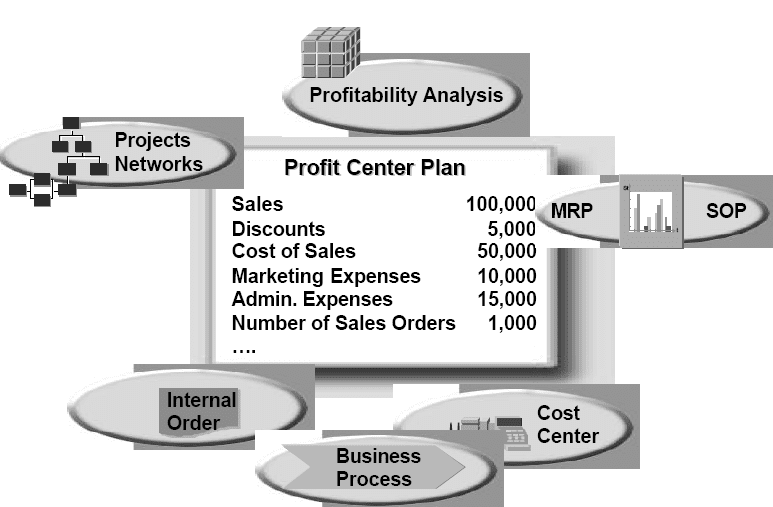 The plan data in Profit Center Accounting is contained in different plan versions. These plan versions let you store separate sets of plan data for the same profit center. For example, you can make a distinction between an operational plan and a strategic plan, or between an optimistic plan and a pessimistic plan. You can display different plan versions as well as actual data in the planning transaction, and use this data to calculate new plan data. You can also analyze and compare your plan versions in the information system. If you want to transfer plan data from other components of the R/3 System, such as Cost Center Accounting, you need to maintain the proper control parameters for Profit Center Accounting. 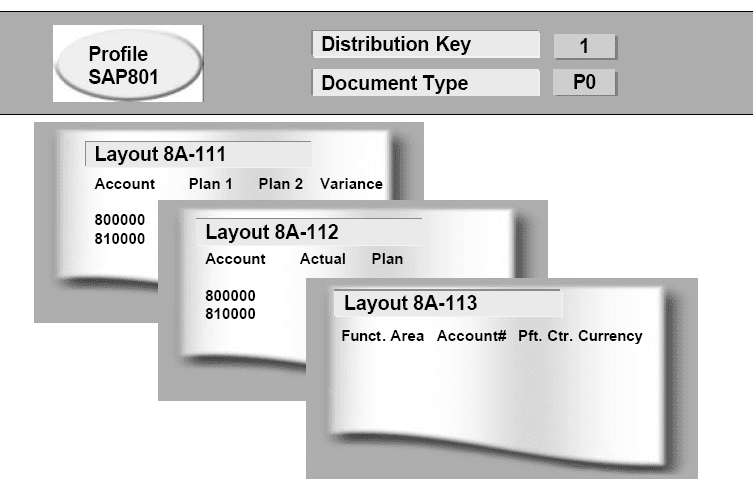 A plan version is always valid for all of the CO Module. When you define a plan version, you also have to maintain specific parameters for the applications in which you want to use it. If the Lock indicator is active for a fiscal year, the plan is locked and can no longer be changed. This makes it possible for you to protect a plan against changes when you are finished maintaining it. The Online data transfer indicator controls whether the plan data should be transferred automatic ally by activity. If the indicator is not active, you need to transfer the postings by fiscal year . The Line items indicator controls whether plan line items are updated in Profit Center Accounting. The line item documents record every change made to a plan. 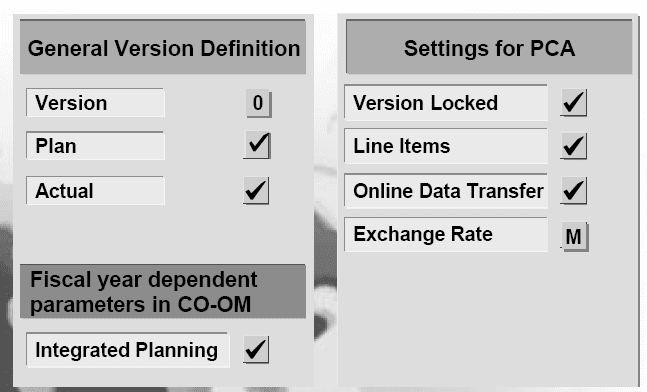 You also need to specify an exchange rate type to determine which rate the system should use to translate the plan data manually entered in that version.The exchange rate type is only relevant for plan data, which is manually entered. Sales Plan: The starting point for short-term planning is the sales plan, in which you determine the quantities you expect to sell during the planning period. The sales plan is usually created by the sales department. The planned sales quantities are then passed on to production planning so that the planned capacities and activities can be coordinated. Master Production Plan: The master production plan is worked out in close coordination with the sales plan. It determines both the capacities and the quantity requirements for raw materials and operating supplies. The planned activities established here are forwarded to the cost centers, which must supply these capacities in the form of activity units. Furthermore, the cost center managers must plan the costs to be incurred and the activity quantities to be taken from other cost centers based on the planned capacities and activities. Cost Plan (Cost Center Plan) Once the activity units have been planned, it is necessary to plan the costs expected for these activities. Sales and Profit Plan: The planned costs and sales quantities can then be used to derived planned contribution margins. The costs from cost center planning and the planned sales quantities (valuated based on the expected revenue) are used in sales revenue planning. It is possible to transfer plan data real-time from cost centers, business processes, internal orders and projects/networks to Profit Center Accounting for each activity. 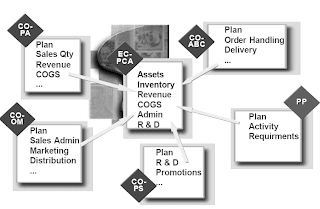 The system reflects every planning activity in Profit Center Accounting. This lets you observe the progress of your profit center plan. 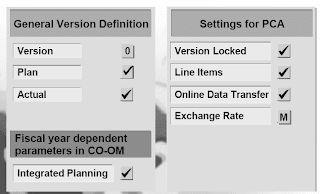 If you do not transfer plan data for CO objects to Profit Center Accounting online, you can post this data en bloc, for single objects or for a single plan version and fiscal year .If you are not working with plan line items, you always have to post all the objects of the selected type using plan data transfer. You can post the following objects: cost centers, internal orders, projects, business processes, networks, general cost objects, profitability segments, SOP orders, MRP orders, real estate objects. Planned overhead (planned primary costs, results analysis, distribution, planned secondary costs, assessment, and so on) is posted to profit centers via the assignment of cost centers and internal orders. For make-to-order production using the R/3 Projects System, you can transfer online the plan data from WBS elements or from networks. Profitability analysis lets you transfer revenues from revenue planning. It is possible to transfer planned values and quantities periodically from costing based Profitability Analysis (CO-PA) to Profit Center Accounting. (Previously it was only possible to post plan data subsequently from account-based CO-PA.) SOP orders and MRP orders are objects in sales and production planning. Their purpose is to provide a rough plan of the production activities required to realize the planned sales. The production plan for product groups is divided among the individual products, which are assigned to profit centers. You can define more than one lead column. Plan in different currencies  You can define formulas in individual columns. You define your planning layouts in Customizing. You can define each row separately. You choose, for example, the characteristic account and enter "*" to choose all of its values or XYZ for a specific value. You can also choose a value field to place the value fields in rows.You can define the whole lead column by not selecting any characteristic value (*). The user will be presented with a blank row and enter specific characteristic values. This option also makes it possible for you to define more than one lead column. 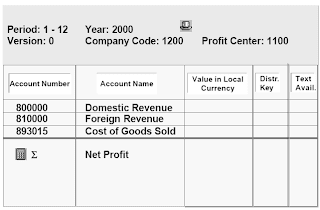 Value columns are defined using key figure, such as Profit Center currency, Local currency. You decide whether you want the value fields to appear in the rows or in the columns when you define the first element of the layout. This decision cannot be reversed. When you define a value field in a row or column, you can also specify characteristics to limit the value field. Distribution key to distribute the aggregated values to periods .A unit for the value field (either a Currency or a Unit) .In addition to the planning columns, you can also define formula columns and formula rows. 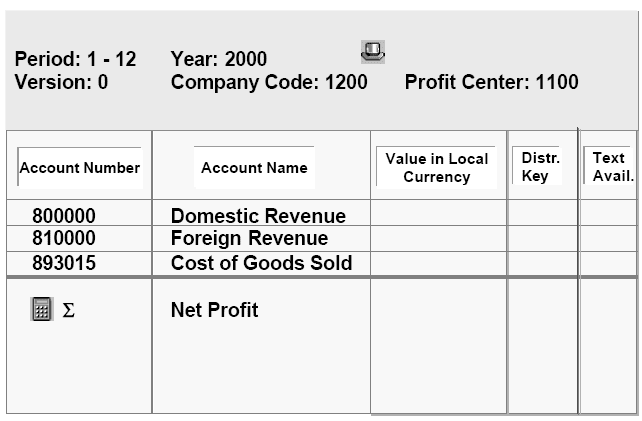 For example, you can have the system calculate the contribution margin using the values you enter. General Data Selection. Here you specify settings which are valid for the entire planning layout. In a layout for cost and revenue planning, you choose the characteristics "Version", "Period", "Fiscal year" and "Profit center" in the general data selections. The value columns contain key figures. When you enter planning data, the system asks you to specify values for all the variables defined in the selected planning layout. By storing defaults under ”Parameter Settings' for these values in a planner profile, you can make it easier for users to choose the planning segments. The user can generally overwrite these defaults. However, it is also possible to block them so that they cannot be overwritten.By assigning an authorization group to a planner profile, you can control what objects your users are authorized to process. This is particularly important for decentralized planning. You can design planner profiles specifically for each planner and assign an authorization group to these planner profiles to ensure that each planner plans only in his or her authorized area. n This function lets you copy existing transaction data to create a new plan in Profit Center Accounting. For example, it might be useful to use the actual values of the current year as a basis for you plan for the coming year. First you need to specify which data you want to copy. Then specify where you want to copy the data.You can revaluate the selected source data, both in terms of currency amounts and quantities, when you copy it to your plan. To do so, enter revaluation factors in the fields provided. If the available fields for currencies and quantities are insufficient, you can define a user exit to revaluate the data according to your needs. If you specify Revaluation, you can correct the values by adding or subtracting a certain percentage. For example, you can create a plan for 1999 by copying the 1998 actual data and adding 5%. To do this, you need to enter a revaluation factor which calls for a 5% increase. You also need to specify whether the system should overwrite existing data in the target plan, or whether it should be added to the data you copy. Source Plan data: Here you enter the record type, company code, and fiscal year you want to plan. 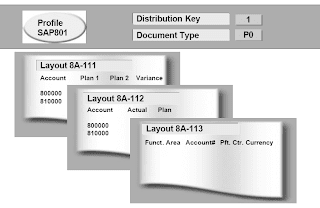 Specify the plan version from which you want to copy the data, if copying plan data. The record type specifies whether you are copying plan or actual values.Destination data: Enter the record type, company code and fiscal year to which you want to copy the data. Specify the plan version. Accounting must be complete. Direct planning on profit centers must also be complete.The allocation functions Assessment and Distribution let you transfer plan or actual costs and revenues (such as overhead) from one profit center to other profit centers. You can also distribute balance sheet items (such as raw materials or real estate) which cannot be assigned to a single profit center . In Profit Center Accounting, you can only allocate data within one company code. In addition, each assessment or distribution cycle must be assigned to one company code. When you assess data, the system always transfers values with an assessment revenue/cost element. In distribution, the data will be allocated under the same account. You can use other posted values, quantities or statistical key figures as a basis for allocations in Profit Center Accounting.